Last year I wrote a post talking about how I switch between pairing my Apple Watch with my work iPhone during the week and my personal iPhone on the weekends. Yes, I have two iPhones...something my kids give me endless grief about. But I don't carry both of them at the same time (see my GeekDad article here for more details). For the last few months of last year I went through a very heavy period of work related travel and then took the last 3 weeks of the year off. So I got used to NOT having to switch between carrying around my work iPhone and my personal iPhone and I loved it. In fact, I enjoyed it so much that I changed the way I managed having two iPhones. My personal iPhone is the THE device I carry with me at all times now and have synced with my Apple Watch, and my work iPhone is used purely for work email and my work calendar. 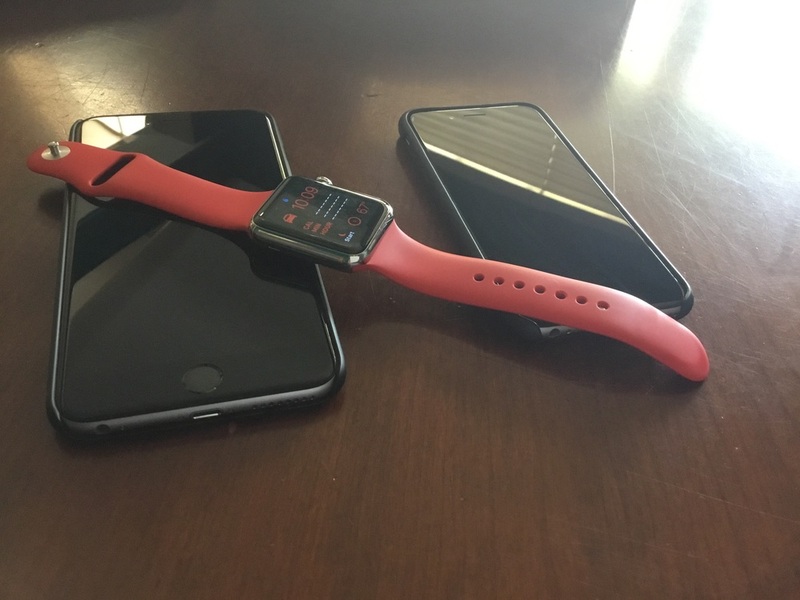 Below I will explain why I am no longer pairing Apple Watch with two iPhones. A smartphone, whether it is an iPhone or any other smartphone, is a very personal device. You get used to having the settings, notification and the applications set a certain way. So switching from one iPhone to another can be disorienting. I tried to minimize this as much as possible by making the location of app icons and setting as consistent as possible between my two iPhones, but that wasn't completely possible. My personal iPhone is the iPhone 6 Plus and the work iPhone is the smaller iPhone 6, so number of apps that would fit on the screen were different. The other issue I had was that I traded in my 11" MacBook Air and 1st generation iPad Air for an iPad Pro this past November. This meant that some of my bedside reading was being shifted from my iPad over to my iPhone 6 Plus (the iPad Pro is just a little to big to serve as a casual reading device before bed). For casual reading the iPhone 6 Plus works great, but the iPhone 6 is just enough smaller that I found myself grabbing for my personal iPhone during weekday evenings instead of the work iPhone 6 I was carrying. I have been using my personal cell phone as my primary voice and text message device since the purchase of my very own flip phone. Before I was offered a work provided cell phone I would just use my personal cell phone number when someone at work needed to reach me. I totally recognize that this would not work for most people, but for me and my situation it has worked flawlessly. I don't get silly or unnecessary work phone calls on evenings and weekends but at the same time I only have to worry about giving out a single cell phone number. The real complication came when I was offered a work provided smartphone, initially a Blackberry and then later an iPhone. My single cell phone number would not always work now. If someone from work would text at my personal cell number during the work week while I was only carrying my work iPhone, then I may not receive that text message on my work iPhone. It depended on whether the text message sender was an iPhone user and whether they were using Apple's iMessage or just regular SMS text messages through the cell carrier. iMessages would be delivered to both of my iPhones since I was signed into iCloud on both devices, but cell carrier SMS text messages would only go to the cell phone that was attached to the cell number used. Since I had always only used my person cell number, anyone not using iMessage would not be able to get a text message to me on my work iPhone during the work week. If I happened to pull my personal iPhone out of my man purse then I would see the text message, but otherwise I would not see it. There is no elegant solution to this. There were only a couple of cases where this was a problem, but it was annoying. After pairing Apple Watch with two iPhones twice a week for over 6-months I reached my limit. Switching my Apple Watch from my work phone to my personal phone on Friday evenings was a real pain. Most of the time I would go right from work to some event or activity and wouldn't have time to switch over. When I did have time, it would take a good 30 minutes. I had the same issue when I would switch back to pairing my Apple Watch with my work iPhone on Monday morning. I typically work from home for an hour early in the morning before going to work, so I could let my watch and iPhone sync while I sat and had my coffee and worked on my laptop. That wasn't the problem. The problem was that in order to make switching iPhones work I had to remember to turn on and off call forwarding and remember to turn off Bluetooth on the iPhone that I wasn't actively using during the week. Every once in a while I would forget one of those settings and miss a phone call or have my car connect to the wrong smartphone on the drive to and from work. I'm a firm believer that technology should make your life easier, not more complex. While I enjoyed getting meeting notifications on my Apple Watch during the work week, it wasn't important enough for me to continue this painful syncing dance I was doing. It was time to just go back to carrying the same iPhone all the time. To have mobile access to work email. Accessing work email from a personal smartphone required certain rules and personal use restrictions I was not willing to accept, so accessing work email on my personal iPhone was not an option for me. To access my work exchange calendar on the go. Most of the time when I am at work I am using my laptop, which of course has access to my work email and calendar. It is only during the times I am walking around the office in between meetings that having access to email and calendar could come in handy. I find myself wishing I had my work IPhone in my pocket about 2 or 3 times a week, but it ends up being a very minor inconvenience at best. Much less disruptive than missing an important SMS text from a family member or one of my kid's schools because I was carry the "other" phone at the time. The other use case where a work iPhone comes in handy is foreign travel and for that I still switch over to using the work iPhone. Foreign data plans are a huge pain to manage and can be quite expensive. I am quite happy to let my employer manage and pay for that for me. Plus when I am overseas, which is only a couple times a year at most, my family knows they need to reach me via other methods so there is no confusion about which phone to contact me on. So my work iPhone is carried around in my "man purse" and only really used if I need to check email quickly at home in the evenings or on the weekends and while I am on travel. It is now a convenient way for me to access work data on the go instead of it being yet another device I have to manage and have on me at all times. Maybe one day the corporate world and the smartphone manufactures will finally make pairing Apple Watch with two iPhones incredibly simple, but until that day comes managing two iPhones was too much of a burden for me.